One of the things I most love about Thailand is the unpredictability of the place. It is possible to go out at night for a beer–just one beer–and have an experience you will remember the rest of your life. It might be wonderful; it might be not-so-wonderful; but it will be wild, wacky, humorous, perhaps poignant, perhaps dangerous. And you might just fall in love. But it will never be ordinary. I know. It happened to me more than once. But the time I most treasure was when I entered Cambodia by mistake. Which was not a good idea as it was during the Vietnamese occupation in the early 80's. How does one enter Cambodia by mistake? And fall in love, almost get killed, and get hoodwinked to boot? Let me explain. At the time, I was sharing a small wooden house in a quiet lane off Phaholyothin Road with an Australian photographer. The Aussie was somewhere on assignment and the Laotian maid next door who flirted with us over the fence had gone in for the night, so I decided, rather than swelter in the heat while swatting mosquitoes and listening to the cries of the lizards, I would go to Patpong for a beer. Just one. I don’t remember which bar it was. It may have been the Grand Prix or the one next door but before long I got into a conversation with two friendly Scandinavians. It turned out they were newspaper journalists from Norway, I think it was, and they were planning to hire a car and driver in the morning and head off to the Thai-Cambodian border–which at that time was a dangerous nexus of Thai police, Thai army, Cambodian refugees, bandits, Cambodian Khmer Rouge and the Vietnamese army. The area made the usual “no-man’s land” seem like a walk in the park on a sunny day. I tried to tell this to my newfound Scandinavian friends but they were in Thailand on assignment and they had no choice but to get a story from the refugee camps along the border. I tried to explain that there basically was no border; and the Vietnamese army was firing on anything that moved because some of the refugees were in fact bloodthirsty Khmer Rouge (Kamen Dang) Cambodian Pol Pot communists who had killed one or two million of their own people. It was when they kept attacking Vietnam that the Vietnamese got fed up and chased them all the way to the Thai border. When shells landed inside what the Thais believed to be Thai territory, they fired back at the Vietnamese. Doing a story at that time in that place was a good way to end up having a story written about you–on the wrong page of the paper. Unfortunately, they were buying beers, and after a few Singha and just a shot or three of Mekhong, I heard myself saying what a great adventure it would be. And so the next morning found the three of us with our car and driver heading pell-mell for Aranyaprathet, the town which was the kind of stopping off point for refugee camp visits. Hangovers-be-damned! I believe we arrived after dark, in any case, I remember nothing of that night or in which hotel we stayed. However, the events of the next day I shall never forget. The journalists had finished breakfast ahead of me and gone out to do whatever journalists do. By the time I exited the hotel, they were heading back toward me. Now, however, they had someone with them. But not just someone. She was one of the most beautiful women I had ever seen. Almond eyes, a gorgeous mane of raven-black hair cascading to her waist, the grace of an antelope, the allure of a goddess, and the half-shy/half knowing gaze of the Asian woman. I could also tell she was Cambodian. This I knew from the beautiful, impossibly full lips. Yes, Virginia, lips like those do not exist only on Cambodian Buddha statues and frescoes; some of the living, breathing women of Cambodia have them. Here in the West, women could achieve such labial perfection only by several injections of collagen, but she...had...it! We spoke in English because it turned out she had fled Cambodia and now lived in Australia. She had got word that her mother may have made it out of Cambodia in the latest wave of refugees and could we in some way help her persuade the Thai police and the Thai army to allow her into the camp at Ban Tap Prik to search for her mother. Well, two thoughts went through my head so fast it was almost simultaneous. The Thai police and army were incredibly busy and had their hands full with Cambodian refugees, the bloodthirsty Cambodian communists and the Vietnamese army–and they weren’t about to allow a Cambodian from the Thai side of the border to enter and muck about in the camp. Second, she was absolutely gorgeous and whatever she wanted me to do was exactly what I would do. In fact, if she had said she would sleep with me that night and all I had to do was to torture and kill the two Norwegian blokes, well, let’s just say, their newspaper would have been hiring. But I figured even if the Thais said no she would be suitably grateful to the man who did his best to reunite her with her mother. 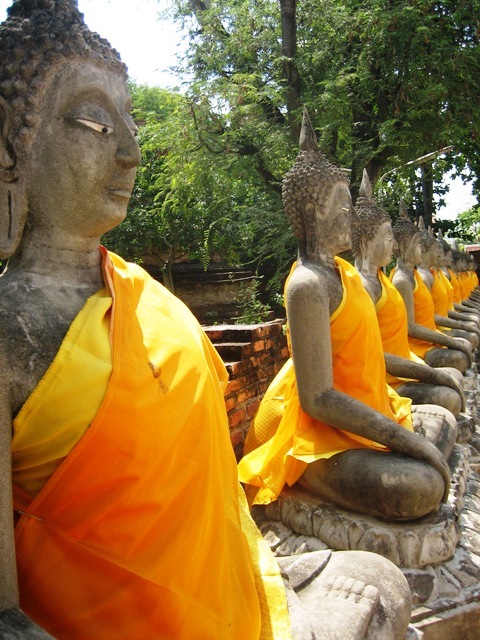 So off we went–or, rather, off I went, to attempt to plead her case with the Thais. I waiied them and used every bit of whatever polite Thai I might have picked up from Dr. Chalao Chaiyaratana’s English School in the late 60's to explain the situation and allakazam! They said yes! She could go in and look for her mother! My first impression was how dark the hundreds of Cambodians staring at us were. It reminded me of my travels in India. No, they were not that dark, but darker than the city Thais, certainly. And how they stared. Silently. Expectantly. 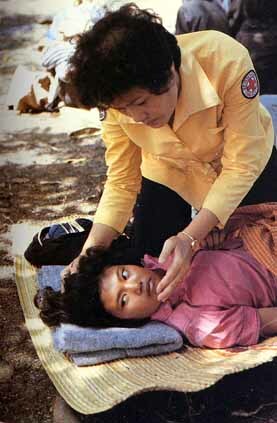 And in the midst of them were those lying on the ground being treated by Thai and Cambodian nurses. Those with IV bottles dangling from the tamarind tree branches above; those too weak to brush away the flies from their eyes and mouths; those obviously more dead than alive. And as we walked toward those dying of malnutrition, disease and the wounds of battle, I noticed men throwing the bodies of men and women over a fence where they were rapidly piling up. We stopped beside two young girls lying side by side. They were not emaciated or wounded but seemed to have been felled by a combination of hunger and disease and the madness of the Cambodian communist leaders. For these two teenagers were typical of the rank-and-file of the Khmer Rouge. Both were very pretty and both stared up at the Cambodian woman from Australia. Finally, one of them spoke to her. I asked her what the girl said. She said they wanted to know why she hadn’t cut her hair short as Pol Pot had ordered. And that showed clearly the limited parameters of their world. Nothing existed outside of the framework of Pol Pot’s bloodthirsty plan for Cambodia. And if Pol Pot told these and a million other teenagers to kill, then that is what they would do. The woman began interpreting for the journalists. I had remembered to bring some candy for situations such as this. And I placed a pack of M&M’s into the right hand of each girl. They looked over at the packet and then at me. It was then I realized they were too weak to open them. I stooped beside them, opened the packages and poured the candy into their palms. They placed some slowly into their mouths. He spat as if in derision of the Thai army. “That is the Vietnamese army,” he said. After a few seconds of realizing how close I had come to capture or death, I turned and walked back in the direction of the camp. To this day, I wonder at the irony of being saved from the Vietnamese by a soldier of the bloodthirsty Khmer Rouge. I sometimes wonder if, whatever his crimes, he had gained Buddhist merit in saving me. I walked past an area of Cambodian children, no doubt orphaned by the war, and in a bit of Thai and a lot of gestures, we talked. They produced some drawings they had done of Angkor Wat and village scenes and gave them to me. I had nothing left to give them. Then I remembered a Cambodian go go dancer on Bangkok’s Patpong Road had taught me to sing some lines of “Tell Laura I Love Her” in Cambodian. And so, much to the delight of the children, I serenaded them. Here, in the midst of poverty, disease, danger, the fighting and the dying, I sang of young Laura’s heartache of losing her beloved Tommy in a stock car race accident and of her eternal love for him--a ballad from the America of the late (and innocent) 50's. A time when no one knew where Cambodia was. A time when one death could still mean so much; in stark contrast to those millions of Cambodians dying of disease, hunger and methodical beatings dying unknown and unserenaded. Eventually, I moved on in search of the Cambodian lady and my newfound Norwegian friends. I found the two journalists looking over their notes. I asked them where the Cambodian woman was. “Oh, she’s gone,” one of them said. Without looking up from his notebook. Needless to say, I was dumbfounded. Had this been an early silent Charlie Chaplin-type movie, the caption here would have read: “Sexist gets his Comeuppance.” She had used my lust for her the way an experienced combatant uses an opponent’s aggressiveness and strength to execute a judo throw. And Cambodians being the world’s most innocent people, if she could trick me, anybody could. From that moment on, until we got back to Bangkok, the journalists and I argued about whether or not her cover story was “very professionally done” as they said, or “a heinous lie,” as I contended. We had about reached Bangkok when I finally became convinced they were correct. I suppose the only crime of a journalist is not to get the story. And she hadn’t really harmed anything except my ego. While I had been in the camp, the urge to do something had been overwhelming and I did manage to get an address from a Thai nurse where people could send money directly. This information I managed to get into a Bangkok hotel magazine. I can only hope it did some good. And I thought, Yes! That is exactly it. When helpless in the face of death and the dying, flirtatiousness is itself a denial against giving up. Against giving in. Against capitulation A way of not allowing Death to have a final victory. January, 2003: Living in Thailand again means traveling out every month or two to get yet another tourist visa so that I can legally return to Thailand. Friends assured me it was not difficult to get a visa at the Thai-Cambodian border of Aranyaprathet where I had not been for nearly a quarter of a century. And so it was that I headed for Bangkok’s Hualumpong Train Station to catch the 1 p.m. train to Aranyaprathet. I ignored the touts outside the building and once inside headed for the information counter. Two young Thai women informed me that the train was only about US$1, but it took six hours, was third class and had no air-conditioning. They suggested I go to the bus station and take an air-conditioned bus. Very seldom do the employees of one organization suggest to a potential customer that he would be better off doing business with another organization. This being Thailand where anything and everything is possible, it is possible the women are getting kickbacks from the bus company. But I don’t think so. I think they sized me up as being a bit long in the tooth for a rugged, non-air-conditioned, six-hour train ride and decided to be kind. So I grabbed a taxi and headed off for the Morchit bus station. On the way there, the thought occurred to me that just maybe the young women working at the bus station might find me a bit too long in the tooth for a bus ride and suggest I take a plane out of the country to renew the visa. Fortunately, they did not. The bus left at 12:40 and cost about US$3.50 for the 4 ½ journey. A very pleasant trip in which although Thai love songs were played, thankfully, the TV was not turned on. Nor did the bus driver indulge in the much-loved Thai bus driver pastime of racing other buses. As we neared our destination, the land became flat and dusty and I was pleased not to be coming here in either the hot season or the rainy season. We arrive at the bus station in Aranyaprathet and everyone piles out. A few tuk tuks and their drivers waited nearby. I wasn’t certain how close the town was so I wasn’t sure if I needed a tuk tuk (samlor) or not. A young, dark-complexioned Thai man with a saucer-shaped hat looked me over and asked me where I was going. Me: I need a hotel. Me: I don’t know; I haven’t been here for a long time. Him (pointing): The one right back there is one thousand baht a night (about US$23). Me: Is this the town beginning over there? Him: No. Aranyaprathet is about two kilos away. How many nights you stay? Him: So why not stay in the Inter Hotel inside the city, only 500 baht? Me: Is it a good hotel? Him: Sure. You stay only one night, you spend one thousand baht on hotel, you stupid. Me. Wait a minute. The driver wants 40 baht to get to the Inter hotel. Is that a good price? Me: OK, thanks. You speak good English. The Inter Hotel is on a quiet street, a very quiet street. Almost like being in a Florida retirement community. I am quoted a price of 550 baht (US$13) which I accept. The room is clean enough and has air-conditioning. I see no other guests, Thai or foreign, until later that evening. I decide to walk about the town. I remembered Aranyaprathet as a rather depressing little town, and it still is. However, just across the Cambodian border are seven casinos which Thais and others love to flock to, especially on weekends. As gambling is illegal in Thailand, the Cambodian and Thai owners are doing very well indeed. After walking for a while, I hire a motorcycle taxi to take me around the town for about 20 minutes. The woman vendor of fruit next to him asks me how much I pay. How about 100 baht, she says. For 100 baht I will go to Ayuthya, I say. She laughs and translates for the driver. He smiles. Slightly. As I ride about on the back of his motorcycle he talks. As his Thai is not Bangkok Thai, and as my Thai is somewhat limited, our conversations are not always clear. But 45 minutes later he drops me off at the hotel and asks for 200 baht. I decide not to bother bargaining and pay him what he asks. Inside the hotel restaurant, I am the only guest. I order Thai omelet with pork and a chicken dish. Within minutes a piece of chicken is stuck in my throat; it won’t go in or out. I can still breathe but it is serious. I stand up and keep coughing and choking. Tears stream down my face. I wave the only other person in the room over: the waiter. He rushes out and calls the hotel manager just in the other room. He enters, sees me standing up by the table, and asks if I want the bill. No, I don’t want the bill; I am f**king dying here, got it?! But I have to try not to laugh while choking. I motion for the waiter to hit my back hard. Being a Thai, he is reluctant to hit a farang hard on the back but gives it a try. He does bring me water which seems to do the trick. I calm down but decide that I need no more food for the night. The night is pleasantly cool and I take a walk. The people of Aranyaprathet seem neither overly friendly nor unfriendly. They are no doubt used to foreigners arriving here for visa purposes; either to go on into Cambodia or to simply get the visa and reenter Thailand again. The next morning I check out after breakfast. The woman at the front desk is dressed in long-sleeved shirt and jacket. She complains about how cold it is. When it is pleasantly cool for a foreigner, it is freezing weather for a Thai. I walk through the town, look about the Market (Backpacker) Motel but spot no backpackers. Perhaps they are all out packing their backs or whatever backpackers do. I hire a tuk tuk for 50 baht to take me to the immigration station at the Thai-Cambodia border. We arrive at a dusty area with busses, vehicles, refugees, long lines of patient Thai vendors pushing their wooden two-wheeled wagons returning from Cambodia, beggars, child-beggars, immigration officials and a marketplace. The sun is beating down; dust and confusion are everywhere. A young Cambodian man about 18 or so approaches me and begins speaking in English. He shows me a book of his foreign “friends” and how they paid him a few thousand baht for his assistance in getting a visa. I tell him thanks but no thanks. However, I notice he has several immigration forms for both countries and seems to know how to save me quite a bit of time. I demure but he follows me as I walk. I continue to watch my shoulder bag carefully and politely ignore the entreaties of beggars. He also warns me to watch my shoulder bag. The young man meets up with a man in a white uniform; a Cambodia policeman who looks over my passport and asks for the money. I know the correct amount is 1,000 baht and I know Cambodian immigration officials often like to charge more if they can, so I immediately give him the thousand baht so he will know that I know how much it is. The boy says it is 1200. I say no, it is 1,000. The boy says OK but give him 100 baht tip. Reasonable enough. And I made my point that I know how much it is and this is in fact a tip. So I give the tip as well as the 1,000 baht and the policeman walks off to his booth. While I wait in a bit of shade in the midst of the chaotic, confusing, cacophonous, sun-drenched scene on the bridge between the countries, the boy begins filling out my paperwork for me. He has definitely done this before. The “Eastern Border of Thailand” sign is in three languages. The line of Thai vendors returning from Cambodia stretches out a looong way. They and their dilapidated wooden carts are covered with dust. As a Thai policeman spot-checks the line, the line moves slowly, if at all. I can only feel sorry for people having to make their living in such a manner. The policeman returns and hands me my passport with its visa for Cambodia. The boy points out where else I have to go and even gives me a Thai immigration form for when I return. Inside one building, there are three short lines: Those with Thai passports, those with foreign passports and those with “border passes.” Those waiting in the “border passes” line are very dark-complexioned, poorly dressed, and one man holds a chicken in his much calloused hand. The boy walks with me right into Cambodia. The town of Poipet is just ahead and from what I can see of it, is dusty and less interesting than Aranyaprathet. We pass the seven gambling casinos that draw the Thai gamblers and he mentions some Cambodians work in the casinos but that Cambodians are not allowed inside to gamble. The casinos -- Princess, Star Vegas, Golden Crown Club, Tropicana, Grand Diamond City, Holiday Palace and Holiday-Poipet -- are owned and managed by Thai politicians and businessmen, Taiwanese, Indonesians and others. All with the blessings of Cambodian officials. The casinos take up an area of about one square kilometer. I look at the boy and guess his age to be about 18. tell him a bit about how over twenty years before the Vietnamese army and Cambodian Khmen Dang (“Red” or communist Cambodians) were fighting very near here. And how many died, including young women. He says they are not there anymore but there are very young Vietnamese and Cambodian women available if I want them. Over 20 years before, Cambodian women were killing each other or else starving or dying of disease while fighting the Vietnamese. Now they are no longer starving or fighting; they are simply kept somewhere in brothels. Progress comes slow for women in poor areas of the earth. Anyway, I give him my usual excuse whenever a Thai man asks if I want a woman. I tell him I am old now: gae lao. Unfortunately, he misunderstands it as gin lao, (“drink whiskey”), and he enthusiastically says, yes, sure, we can do that. Finally, I tell him I am heading for the Holiday Palace Casino, hand him 200 baht (US$4.65) and bid him goodbye. He seems satisfied, thanks me, and walks off. I glance briefly at the nearby beauty massage, salon and sauna, then head for the casino. I am pleased to be out of the sun and away from the dust and enter another world: the Holiday Palace. The area looks more like a shopping mall than a casino. I stroll around the huge space off of which are several shops. A pawn shop offers gold necklaces, watches and mobile phones left by hapless gamblers who lost what they had. A mobile phone shop offers the latest deals on mobile phones. And there is even a duty free shop. In the center of it all are tables and a buffet lunch. There is also a luxurious Japanese and a luxurious Chinese restaurant. I decide to take a rest at what appears to be a Starbucks ripoff. The color of the logo is the same shade of green but the Palais Coffee design has an Asian face surrounded by stars. And so, not far from where Cambodians once lay dying, I sit back in air-conditioning and enjoy my cappuccino frappe and strawberry waffle. I enter a doorway marked “casino,” allow my bag to be cursorily checked, and enter. There are the usual sounds and lights of a casino and the usual games preferred by Asians: Fan tan, baccarat, electric horse racing machines, poker slot machines. And a poker table for Western tourists. And blackjack and roulette. I try my luck at the poker slot machine and win about 200 baht. I walk to a roulette table and place 500 baht on two numbers and one row. I lose it all in one spin of the wheel. The pretty Cambodian croupier says, "Sorry," and rakes in my chips. I walk out and cross to the nearby Holiday Poipet casino. Inside it is much the same but not so spacious. I check at the desk and learn that a single room ranges from 1,000 to 1,500 baht, depending on weekday or weekend. These casinos are nowhere on the level of Las Vegas or Monte Carlo but on the other hand they have more dignity and cleanliness than those of Macau. While none will ever be confused with a Donald Trump casino in class and luxury, nonetheless they have something Donald Trump can only dream about: rooms full of Asian gamblers who, unlike many of the Caucasians strolling about, are there to gamble. After a while, I leave the casino, and, recrossing the small bridge, walk to the Thai immigration booth. There is no problem and I am soon in search of a tuk tuk to take me back to the Aranyaprathet bus station. But a crowd of children spot me and surround me holding out their dirty little hands for money. I give them change and when I have nothing left for the last of them, he points to my bottle of Sprite I have just opened. I gesture to ask if it is OK for me to take one drink. He gestures back that it is OK. I take a swig and hand it to him and he is happy. A 50-baht tuk tuk ride gets me back to the bus station where I hand a woman 180 baht and she hands me a ticket to Bangkok. She also hands me a bottle of water and a small package labeled “layer cake.” Soon we are on our way. Along the way, I doze off into a kind of half sleep and images of both Aranyaprathet trips crowd in on me, including the bizarre image of young Cambodian refugees being tended to by Thai nurses on the floor of a casino. When I wake up we are in Bangkok.